Like a less attractive relation, the old First National Bank building, located at Baltimore and George streets in Cumberland, pictured here, is often overlooked in favor of its famous, Bruce Price-designed neighbor–the Second National Bank building at Baltimore and Liberty streets. Considerable confusion exists because of the history of the reorganization of various banks in Cumberland over the centuries. I’m not going to attempt to reconstruct this history here beyond its direct relevance to the two buildings. The Cumberland Bank of Allegany was founded in 1812 and chartered as the First National Bank of Cumberland in 1864. It first located at Baltimore and George in 1858 (Pictorial, 91). 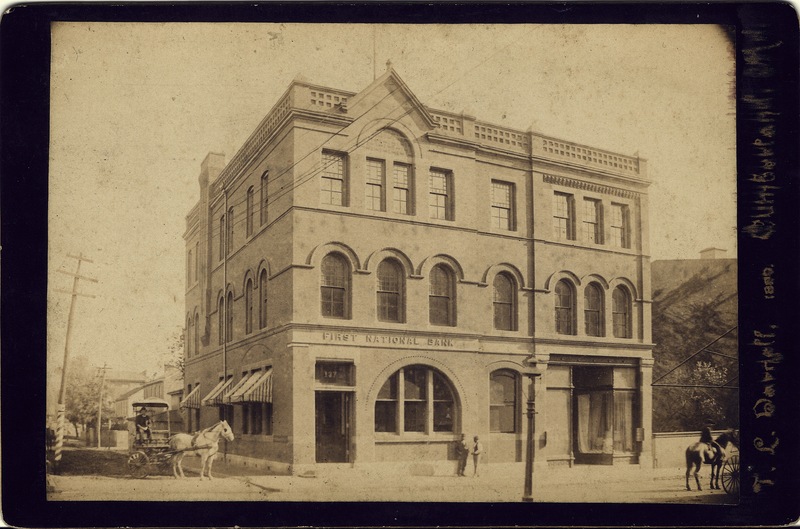 Pictured here, the First National Bank building at Baltimore and George was built ca. 1889-1890 from a design by a forgotten architect. Although blurred, the date on this cabinet card photograph appears to be 1889. In 1912, the bank’s facade was either altered beyond recognition or a new building, which still exists, was built upon the same location. Further evidence of our building’s date of construction is the absence in this photo of the old YMCA building to its right, which is clearly visible in later photographs. According to Schwartz, et. al., the old YMCA building was built about 1893 as a three-story structure; two more stories were added in 1910 (Pictorial, 40). An article focusing on changes in this block dates the old YMCA building to 1894. I think today the newer bank building at Baltimore and George is occupied by the First Peoples Community Federal Credit Union. Bruce Price designed the more ornate and famous Second National Bank building at Baltimore and Liberty. According to Schwartz, et. al., the Second National Bank of Cumberland was chartered in 1865 and moved to Baltimore and Liberty in 1868 (Pictorial, 24). Some sources give 1888 as the Price building’s origin; others ca. 1893. A historic marker on this building confusingly identifies it as the First National Bank, because in 1963 Second National merged with First National to become First National Bank and Trust Company. This building exhibits the distinctive “round-arched Romanesque style” and “steep-gabled wall dormer” described in its survey for the Historic Site Inventory of Allegany County. The Price building at Baltimore and Liberty, on the pedestrian mall, is now occupied by Susquehanna Bank (some sites on the web still say Farmers and Merchants Bank). Now back to our photograph. During this period, according to Ross Kelbaugh’s Directory of Maryland Photographers, the studio of Thomas L. Darnell (1825-1908) was located at 96 Baltimore Street in Cumberland, and I’ve found other Darnell cabinet cards with the location 106 Baltimore Street. Kelbaugh dates cards that include “and Son” to 1880-1901, but this card, dated 1889, doesn’t fit that schema. We know the photograph depicts a building ca. 1889-1893, so more work on Darnell’s business history remains to be done. Darnell includes a few figures to add life and scale to the scene, which captured the building’s facade with the sun full upon it. Only slight shadows in casement corners pick out the lines of the high, handsome, leaded double-height windows. I have a old photo album full of pictures from this photo Grapher, dated as far back as 1889, are they worth anything. Thanks for reading my blog, Angela . . . Worth is determined mostly by the subject and the condition of the photograph. Identifications–especially in period ink or pencil–help make card photographs more desirable. Identified Civil War soldiers in full uniform tend to bring higher prices. Why not put them up for sale on ebay and see what happens?